Can I use the Dario Meter with a phone case? Some protective phone cases, especially heavy duty or thick ones, can prevent the meter from being fully inserted. For more information about this, please call us at 1-800-895-5921 Monday – Friday, 9AM – 5PM Eastern time. Do I need to put a plastic/disposable cover on my phone? Does my Dario need batteries? Your Dario does not need batteries. The power comes through your smartphone’s audio jack, so make sure to keep your phone charged. You don’t want to miss a blood glucose reading or phone call. How often should I replace the lancet? Ideally, you should replace the lancet with each use. The lancet doesn’t seem to be drawing enough blood. Can I adjust the lancet? Yes. It is easy to adjust the depth of your lancet. After inserting the lancet, change the dial to your desired depth; 1 is the shallowest and 4 is the deepest. I just received my Dario and the white cap won’t stay on. Why? In order for the cartridge cap to stay on, you need to insert an cartridge of strips. Then it will stay attached to the rest of your Dario. Does my Dario need to be calibrated? No, there is not need to calibrate your Dario. I’m getting different results with my Dario than with my old meter. Why? How do I know if my blood glucose readings with Dario are accurate? 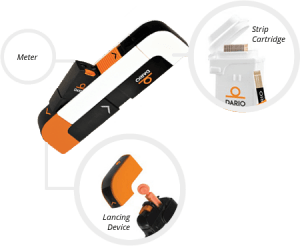 Do I have to use Dario Blood Glucose Test Strips with my Dario Smart Glucose Meter? Yes, you must use Dario strips with your Dario meter to get accurate results. Will the Dario connect with iPhone 7, 8, and X? Yes! Our newest meter, Dario LC, works with the newest iPhone versions with a Lightning connector. You can purchase the Dario LC meter directly from our shop at https://shop.mydario.com/ or by calling 1-800-895-5921. 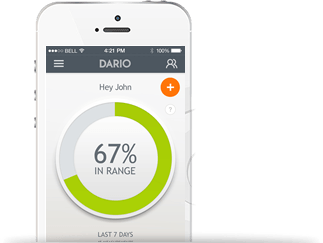 Which smart phones are compatible for use with the Dario Blood Glucose Monitoring System? My Dario is giving me an error message or is not connecting. What should I do? What happens if someone tries to call me when I’m taking a blood glucose test with my Dario? If someone calls you while you are testing your blood sugar and you didn’t receive the result yet, you should test again with a new Dario strip. You can test in the Do Not Disturb or Airplane Mode if you want to test without interruption.